Over the winter there will be major work to return White Rock to its status as an industrial heritage park, to protect it as a Site of Special Scientific Interest, and to install interpretation. Watch this space for more exciting news! We have stayed as busy as we can on site over the winter, but the weather has not been kind. All the same we have brought much more of the building next to the ramp into view, and discovered yet more mystery structures – haphazard is hardly the word for it. This was pre-planning permission or any other kind of permission or control. Research has continued apace with several new discoveries. These and the new 3D computer model of White Rock will be shared soon. 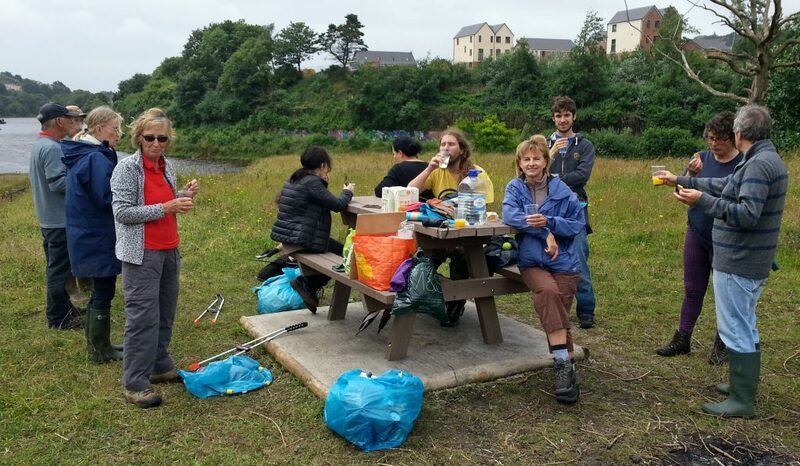 On Sunday 24 September the Friends of White Rock and the Geocachers held a litter pick and clearance as part of Keep Wales Tidy’s annual Be Tidy Month – www.keepwalestidy.cymru/betidy. See the Clearance page for photos! Things are moving on the clearing the hazardous and other waste, albeit slowly. Watch this space for updates, or come along one Thursday morning to see for your self – Clearance. Read the Friends of White Rock Annual Report 2016 2017. 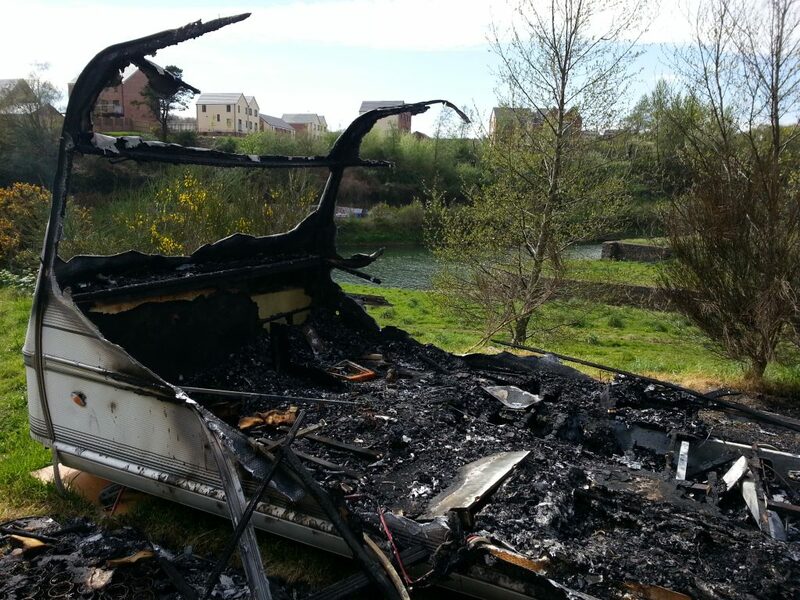 Guided tours of White Rock, especially for youngsters, have been suspended in recent months because of the presence of anti-social elements who have spread hazardous waste, lit fires, and burned out an illegally parked caravan near the Great Workhouse. 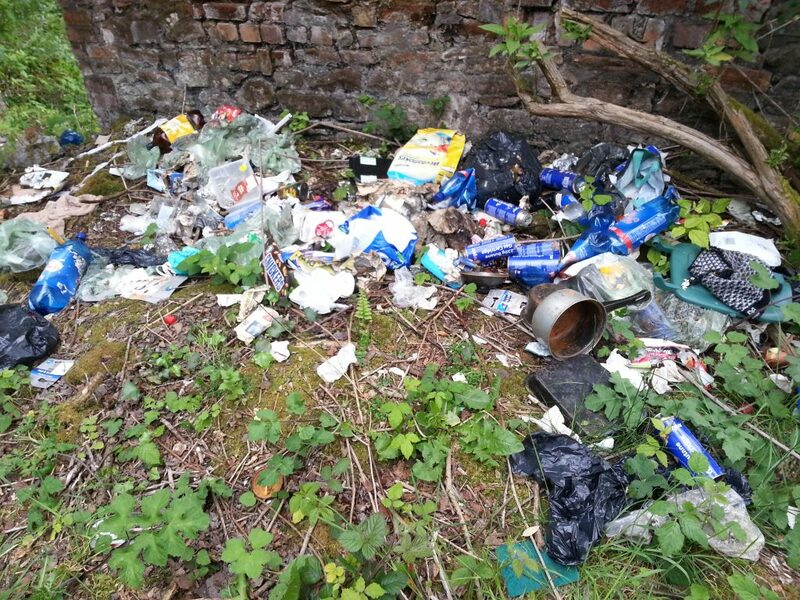 Rubbish left around the Great Workhouse and the covered section of the Smith Canal contains needles and other drug paraphernalia as well as human waste and toilet paper. This is beyond the resources of the Friends to remove. 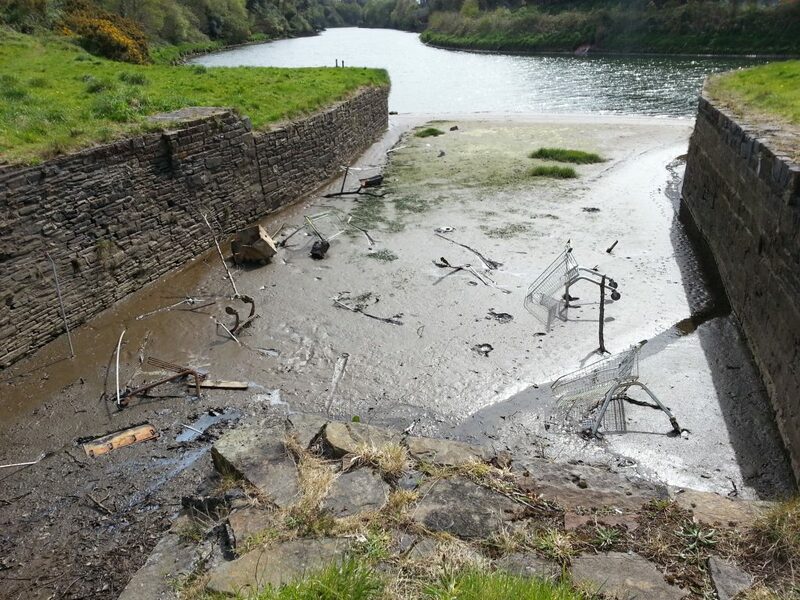 An on-site meeting on 19 May with Swansea Parks Department, the police, and Cadw, and with the support of Keep Wales Tidy was a crucial first step to resolving the problem. The caravan will be removed, but it is not clear if the council will also remove the dangerous waste. Watch this space for further reports. We have continued clearance and research despite the wet weather. As usual as many mysteries as answers appear – it keeps us on our toes! We took a group of teachers up Kilvey Hill, the first time some had been up to see the view despite being born in Swansea. The spring season kicked off on Sunday 12 March with a litter pick and clearance in company with our old friends the Geocachers. Drop us a line at info@friendsofwhiterock.org.uk if you would like to join the project. We are taking a break over the holiday period in order to give the mince pies the attention they deserve. Plans for the new year include expanding research on site and in the archives, walking the incline up Kilvey Hill, and more community events with our friends and supporters. Winter is creeping up on us. The Richard Burton session opened some very promising avenues for research. It is clear there is a lot of White Rock material hiding under different catalogue entries, not least papers about the White Rock estate. We will continue clearance on Thursdays when the weather allows, and research at any time. The park is notably clearer of rubbish, litter and unwanted foliage. We will use the new weed slashers to do some maintenance of the secondary growth on the canal path and around the steps wall. 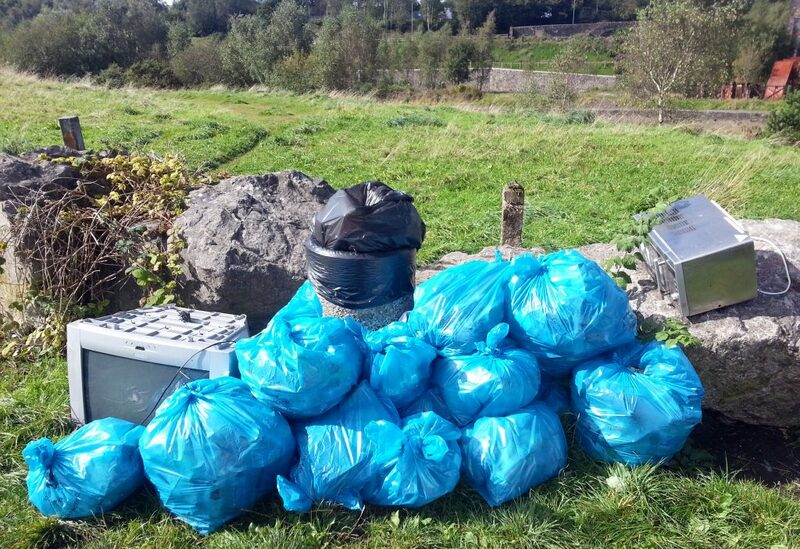 The Geocachers did a magnificent job of litter picking and clearing the river bank in September. A training session has been organised at the Richard Burton Archive in Swansea University. We have already found some very interesting documents there and it is likely there are more, some catalogued for other areas. 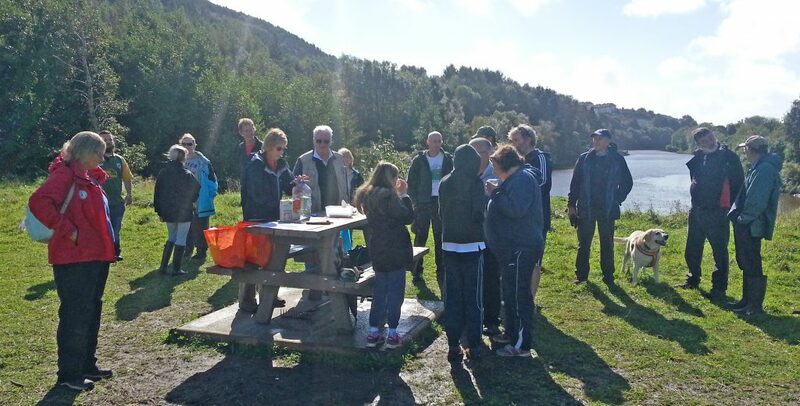 Sunday 25 September, 1030 – 1230 – Geocachers Cache in Trash Out week. Yes please! Many thanks to the Geocachers for their help with the post-summer clear up. The picnic bench has become a destination for dog walkers who like a rest and a contemplate half way round. The Litter Pick and Clearance with the Geocachers on Sunday 10 July was a great success. The site was thoroughly cleaned, and a building interior near the ramp cleared of destructive vegetation. This is the first structure where we have found rendering on the internal walls. Over the summer we have been concentrating on the Great Workhouse. The three entrances are now clear and accessible, and four canal portals have been exposed. The work continues, using the aerial photo reproduced on page 24 of Copperopolis as a guide. See the Clearance page for the latest news and how to contribute to the work parties. We went on a Copper Jack music cruise on 24 April. The steps and wall are clearly visible from the boat, and the Great Workhouse is coming into view. The dock and river bank walls look good, though we need to do some housework on the first wall we cleared. We will soon need to give Swansea Community Boat Trust a new script! See the Clearance page for photos and details of the next Thursday work party. Many thanks to Graham Morse for our stunning new logo. Watch out for Whit Rock volunteers in their dashing t-shirts! We finally got back to work and cleared the wall near the Time Team dig. Many thanks to Jack and Amber of Kilvey Hill Community Woodland for their invaluable help, especially with the trees threatening to undermine the structure. The picnic bench will be installed soon. We have agreed the location with Parks – picnickers will have a lovely view down the river. The weather was so horrible we got little work done on the site. Instead we plotted for the better weather, and continued research into some of the many fascinating mysteries of White Rock. White Rock joined Kilvey Hill Community Woodland, www.kilveyhill.wordpress.com, on 6 December to harvest Christmas trees and clear a stretch of hillside ready for planting deciduous trees. Many hands made light work and there are impressive piles of tree trunks ready for the chipper. A patch of living-room sized saplings provided lovely Christams trees for the volunteerrs. Thursday 22 October – Dean Thomas of ITV Wales filmed at White Rock! See ITV Wales at White Rock for photos and the broadcast date. Sunday 4 October – the first supermarket trolley is out of the river dock and another path is cleared! See the video at Reclamation. 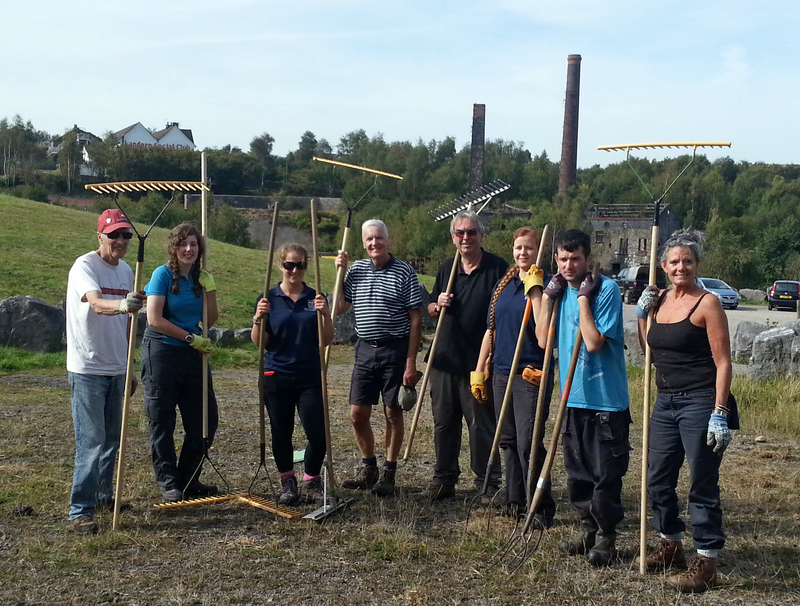 Tuesday 29 September – the Friends and Welsh Wildlife cleared half the grass cuttings from the Spiral Tump. Many hands made light work! We have regular work parties on Thursday morning, 10 – 12 weather permitting. See the Reclamation page for photos and an update on progress in the first half of the year. We have amazed ourselves with how much can be done in a short time by determined people, and of course our friends the Geocachers and Swansea Canal Society. We have received a grant for insurance and tools from Keep Wales Tidy. 18 May. Many thanks to Kate at Connected Communities for posting our recent findings on a possible pre-industrial community at White Rock – River Dock. 7 May. Today’s work party found there has been a substantial fire in the gorse along the top of the riverside wall, from the bank at the entry of the path to halfway along the small field. About 45 metres of gorse has been burned. The ground is black – all the grass has been burned off. There is still a strong smell of smoke so the fire is recent. It was hot enough to partly melt glass bottles and the surface of slag lumps. If any birch or bird nests were in the fire they have been totally destroyed. We could not see any damage to stonework. With a little pruning of dead wood we were able to open up a view of the river while leaving a barrier at the top of the wall. Foliage will soon return but we have the opportunity to manage this stretch and use it to demonstrate our vision. Litter picking in the fire site got the usual haul of cans, bottles and umbrellas, plus three car exhausts and ten golf balls. We removed more of the brash at the north end of the canal / ramp path. The grass around the big stones in the car park has been treated. One of the small wooden posts has been uprooted. The small knotweed infestation beside the canal basin has been knocked down, which will make it spread nicely. And we hardly got rained on at all! Happy Geocachers at White Rock, 26 April 2015! We now have regular work parties on Thursday morning, 10 – 12 weather permitting. See the Reclamation page. We have amazed ourselves with how much can be done in a short time by determined people. We have just received a grant for insurance and tools from Keep Wales Tidy, and our Wren Landfill Trust grant application is in for a much larger clearance in the winter. Recently we tackled the dock and uncovered some fascinating architecture. Obviously we are limited on what can be done during the summer, but we have been round the site again with The Wildlife Trust of South and West Wales and identified areas that can be tackled. We are particularly concerned to stop any further damage to structures by buddleia and other pests. 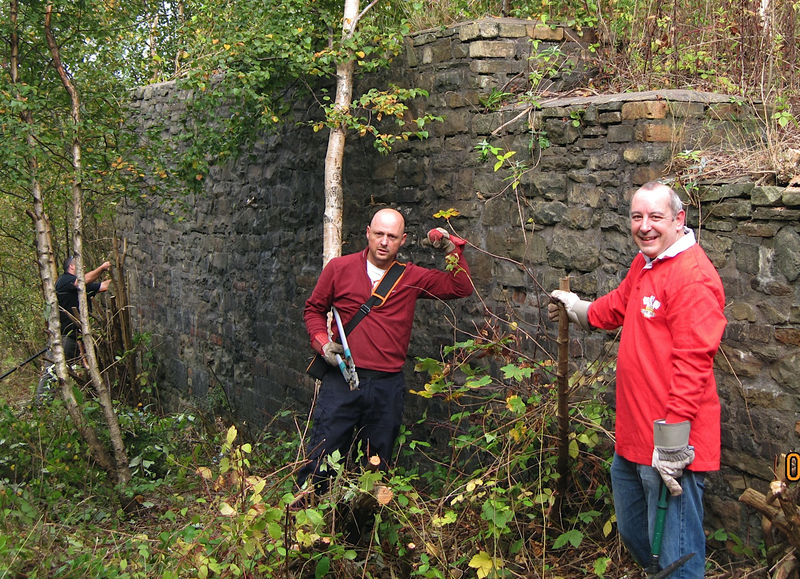 We will also tackle the Japanese Knotweed with help from Keep Wales Tidy, and we expect Himalayan Balsam to arrive this year. We hold Weekly Clean and Clear sessions on site most Thursdays. The next scheduled session is Thursday 9 April 10 – 12. Bring gloves and tools pending our grant application to Keep Wales Tidy. A date for your diary! 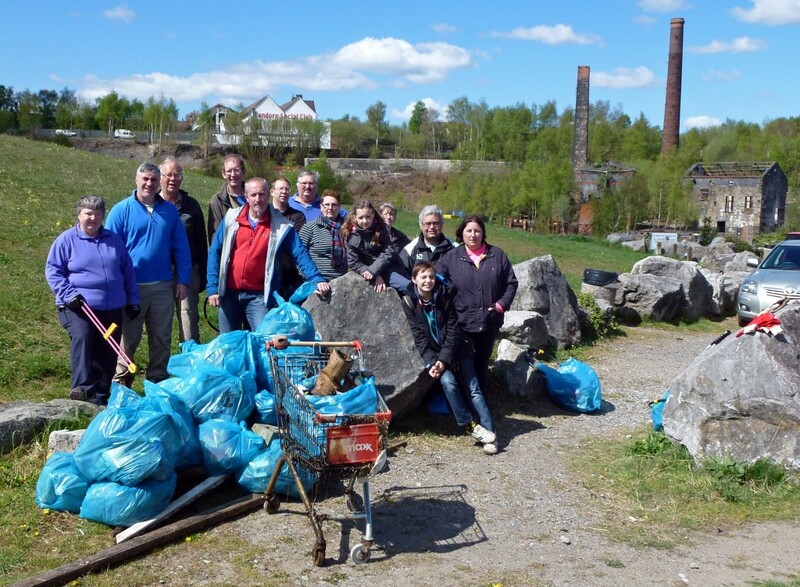 On Sunday 26 April the Geocachers will celebrate their national ‘Clean Up Day‘ by descending on White Rock. Keep watching this for news of how to join in. The first White Rock Clean and Clear day took palce on Sunday 11 January, It was a great success – see the Reclamation page for details and photos. The Friends of White Rock were inaugurated on 25 September. See the Friends of White Rock page for up to date information. Additional summaries of oral histories in West Glamorgan Archives Service have been added – WGAS Oral Histories. Over six hours of recordings and transcriptions have been added to the Oral Histories page, with more to come. Follow the links to three colour movies of the Lower Swansea Valley made in 1960 by Franklin Cardy. At the moment the links are halfway down the Reclamation page. Read the update on Reclamation and our next funding bid, including images of the site as it was not too long ago, and an invasion of the dreaded Japanese Knotweed. There is a link to an article on the pest by Mike Hedges, Swansea East AM. Our original HLF grant has run its course, and we are looking at sources of further funding to keep the project going. If you would like to help with bids, contact info@friendsofwhiterock.org.uk. Funds running out has not stopped the volunteers pursuing their interests. Watch out for updates on the ferry, site history, and the ecology of the site. The White Rock Trails Celebration event at Swansea Museum’s Collections Centre in Landore on the first Saturday of February was a great success. The museum counted 79 people through the door, exceeding all our expectations especially on such a foul day. The Digital Trails app, presented by Adam and the MEng students, is of course the heart of the HLF project. 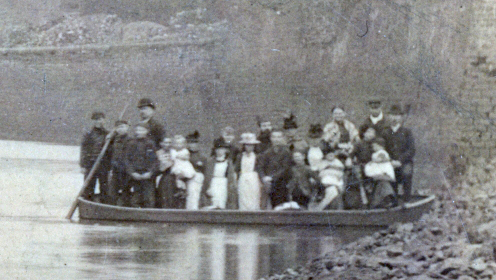 We now have more organisations interested in adopting it to their own sites: Swansea Community Boat Trust (the Black Prince), Clydach Heritage Centre, the Heart of Wales Line, Swansea Council and the Swansea University Sustainability Team, and an enquiry from Aberystwyth to bring it full circle. We are also talking to a number of organisations in England including some of the Connected Communities projects. Rob not only took over every vertical and horizontal space he could find with his displays, he also led a group of hardy souls through the rain for the site walk. Stacey and Dominic’s transcription of the White Rock Deed excited much comment, with requests for copies. We’ll work that out with the Richard Burton Archives. Rosemary’s Schools Pack will soon be in its native environment and we will invite schools to visit the White Rock site. We were delighted that Ken Frederickson came despite frailty. In Tudor’s words, “… Ken Frederickson was thrilled to bits, our star was star struck! !” A sight I will remember for a long time is the blue bus full of people listening raptly to Tudor and Janet’s oral histories. The White Rock Ferry booklet, written by Tudor and Janet Price and launched at the Celebration, is the second publication by the Swansea Branch of the Historical Association. It has been very well received in all quarters, with compliments from professional historians as well as readers with an interest in White Rock and Swansea. Teresa did a fantastic job organising the day. It is entirely to her credit that everything went so smoothly and everyone had such a good time. Up to twenty people on the White Rock Ferry travelled standing up! please can you keep me informed of any activity taking place at white rock ,or if there is any help needed thanks vincent rees. I am a student from Swansea uni, an i am doing a research about White Rock area. Can you advise me what kind of animal is living around the site please? Marsh Fritillary is there, and there is trace of Otter is what i know so far,is there any type of bat? Thanks for contacting us. There are two species of pipistrelle at White Rock. We had a bat walk in June 2015 and saw a good selection. The kidney vetch on the spiral tump supports small blue butterflies. There are also several species of Waxcap fungi on the tump. There are two pairs of kingfishers on the river, and at least until recently a family of mink on the far bank under the long steps. The dock is a nursery area for fish fry, including very young flatfish, eel and mullett. A dead polecat has been found on Kilvey Hill but we have not seen any evidence at White Rock. There is an increase in the number of rats in and around the Great Workhouse, due to the presence of two homeless people in a tent who spread refuse. We are working with the council to clear the area up and hopefully have them moved to a more suitable site. Thank you very much!!!!! I did not expect to get you reply so fast!! well as learning more about the site to help me with my coursework. We hold work parties at White Rock on most Thursday mornings, 10 – 12. We also have occasional events at the weekend, the last being with the Geocachers and Keep Wales Tidy last weekend. There will be notification of events on the web site. We are currently investigating a building that is throwing up more mysteries than answers! Please pass this on to your tutor. We are happy to give a talk or other contribution on White Rock at the college, and to conduct a guided tour for a group of students and tutors. If you have any questions on sources of information let me know and we will do our best to help.